The combination of kimchi, melted cheese, and crisp tortillas is one of those things that sounds weird, but somehow totally works. 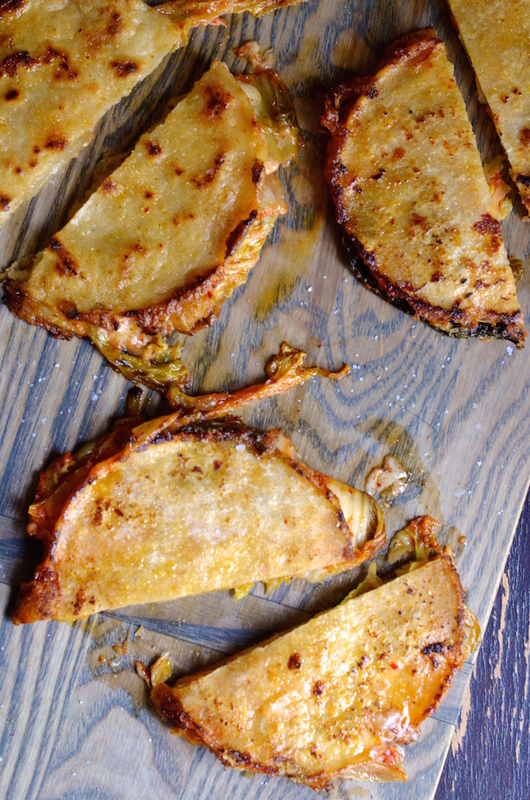 I didn't come up with the concept of Kimchi Quesadillas; that honor goes to Roy Choi of the amazing Kogi BBQ truck in LA. I tried them on my most recent trip to the West coast and fell hard for that spicy, salty, crispy combo. The ingredients are simple. Tortillas (I prefer corn, but flour works, too), some kind of freshly shredded cheese like a sharp white cheddar, and kimchi. 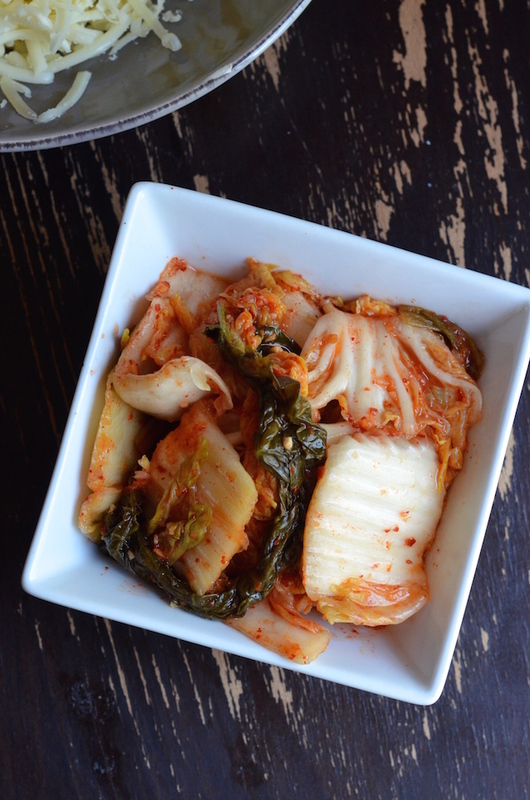 If you make homemade kimchi, definitely use that. If you're buying it, look for a good quality brand. You want something kind of artisan with great flavor, crispness, and spice. Skip the cheap-o mass-produced kind. Oh...and you need butter. A lot of it. Get your skillet nice and hot, melt a nice chunk of butter, and toss in a few tortillas. Layer in the cheese and kimchi, cover them with another tortilla and lower the heat a bit. 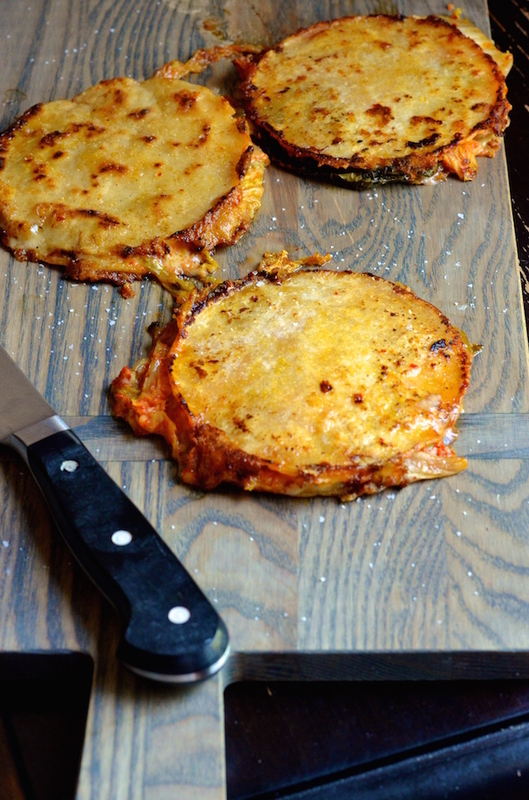 You want the cheese to completely melt, the kimchi to heat through, and the tortillas beautifully crisp. Cut them in half and serve them hot. This is one of those dishes that's kind of awesome eaten around the stove, serving them and eating them right as they come off the skillet. Heat the butter in a skillet over medium-high heat until melted. Swirl the pan around to coat evenly. Spread out the tortillas in the pan and let them crisp for a few seconds. Flip each one, then add a generous handful of cheese and a few forkfuls of kimchi. Cover with another tortilla and press down slightly with the back of a spatula. Let cook about 2-3 minutes, then flip and continue to cook until other side is crisp, cheese is melted, and kimchi is heated through. Remove from pan, cut each quesadilla in half, and sprinkle with kosher salt. Serve immediately.